9 Bedroom Terraced House For Sale in Blackpool for Asking Price £200,000. 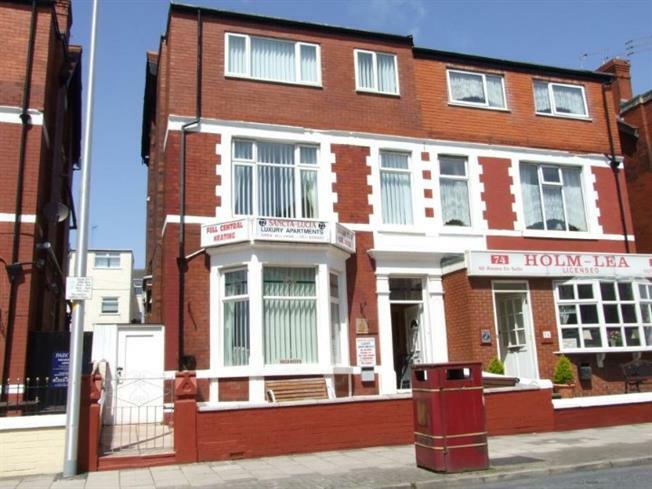 Five self contained holiday flats in the popular holidaying area of Blackpool, well maintained property containing four two bedroom apartments and a one bedroom apartment. Only a short walk to the sea front and Coral island. To be sold with no onward chain. Please enquire foe further details. uPVC front door to the porch and meter cupboard. Single panelled radiator, cupboard housing central heating panel, fire and coving. Double glazed bay window to the front, double panelled radiator, TV point and hatch to the kitchen. Tiled flooring, stainless steel splashback, range of wall and base units, electric hob/oven combi, stainless steel sink and drainer. Double glazed window to the rear, electric heater and free standing wardrobe. double glazed window to the side, double panelled radiator, tiled flooring, wc, wash basin, bath with shower over. Double glazed window to the side, double panelled radiator and two electric heaters. Double glazed window to the side and rear, uPVC door to off street parking, laminate flooring, range of wall and base units, stainless steel sink and drainer, electric hob and oven combi. Double glazed window to the side, double glazed window to the side and rear, electric heater and door to the kitchen. Double glazed window to the side, tiled flooring, wash basin, WC and bath with shower over. Double glazed window to the rear and side, double panelled radiator and TV point. Double glazed window to the side, tiled flooring, stainless steel splash back, range of wall and base units, electric hob/oven combi, stainless steel sink and drainer with hot and cold tap. Double glazed window to the side, double panelled radiator, tiled flooring, wash basin, WC and separate shower cubicle. Double glazed window to the side and double panelled radiator. Double glazed windows to the side and rear, double panelled radiator, electric heater and free standing wardrobe with two chests of drawers. Double glazed window to the side, double panelled radiator, electric heater, free standing warbrobe and two chests of drawers. Double glazed window to the rear, double panelled radiator, electric heater, stainless steel splash back, range of wall and base units, electric hob/oven combi, stainless steel sink and drainer. Double glazed window to the front and side, single panelled radiator and electric heater. Double glazed window to the front, single panelled radiator and electric heater. Double glazed window to the side, single panelled radiator, tiled flooring, WC, wash basin and bath with shower over. Double glazed window to the side, double panelled radiator and electric heater. Double glazed window to the rear, tiled flooring, stainless steel splash back, electric hob/oven combi, range of wall and base units. Tiled flooring, WC, wash basin and bath with shower over.